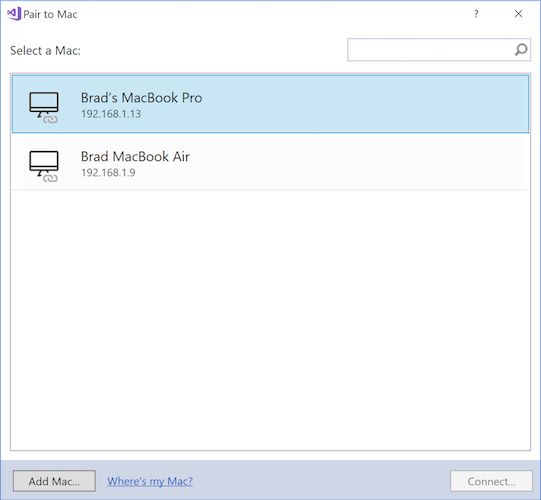 This guide describes how to use Pair to Mac to connect Visual Studio 2019 to a Mac build host. The same instructions apply to Visual Studio 2017. Building native iOS applications requires access to Apple's build tools, which only run on a Mac. Because of this, Visual Studio 2019 must connect to a network-accessible Mac to build Xamarin.iOS applications. Visual Studio 2019's Pair to Mac feature discovers, connects to, authenticates with, and remembers Mac build hosts so that Windows-based iOS developers can work productively. Developers can write Xamarin.iOS code in Visual Studio 2019. Visual Studio 2019 opens a network connection to a Mac build host and uses the build tools on that machine to compile and sign the iOS app. There is no need to run a separate application on the Mac – Visual Studio 2017 invokes Mac builds securely over SSH. Visual Studio 2019 is notified of changes as soon as they happen. For example, when an iOS device is plugged in to the Mac or becomes available on the network, the iOS Toolbar updates instantly. Multiple instances of Visual Studio 2019 can connect to the Mac simultaneously. It's possible to use the Windows command-line to build iOS applications. You must manually open Xcode after installing so that it can add any additional components. If you would prefer not to install Visual Studio for Mac, Visual Studio 2019 can automatically configure the Mac build host with Xamarin.iOS and Mono. You must still install and run Xcode. For more information, see Automatic Mac provisioning. On the Mac, open System Preferences and go to the Sharing pane. Check Remote Login in the Service list. Make sure that it is configured to allow access for All users, or that your Mac username or group is included in the list of allowed users. If prompted, configure the macOS firewall. If you have set the macOS firewall to block incoming connections, you may need to allow mono-sgen to receive incoming connections. An alert appears to prompt you if this is the case. If it is on the same network as the Windows machine, the Mac should now be discoverable by Visual Studio 2019. If the Mac is still not discoverable, try manually adding a Mac or take a look at the troubleshooting guide. Now that remote login is enabled, connect Visual Studio 2019 to the Mac. In Visual Studio 2019, open an existing iOS project or create a new one by choosing File > New > Project and then selecting an iOS project template. Open the Pair to Mac dialog. Or, select Tools > iOS > Pair to Mac. Select a Mac in the list. Click Connect. When logging in, use your system username rather than full name. Pair to Mac uses these credentials to create a new SSH connection to the Mac. If it succeeds, a key is added to the authorized_keys file on the Mac. Subsequent connections to the same Mac will login automatically. Pair to Mac automatically configures the Mac. Starting with Visual Studio 2019 version 15.6, Visual Studio 2019 installs or updates Mono and Xamarin.iOS on a connected Mac build host as needed (note that Xcode must still be installed manually). See Automatic Mac provisioning for more details. Look for the connection status icon. There can be only one connected Mac at a time. If you choose Forget this Mac, your credentials for the selected Mac will be forgotten. To reconnect to that Mac, you will need to re-enter your username and password. If you have successfully paired to a Mac build host, you are ready to build Xamarin.iOS apps in Visual Studio 2019. Take a look at the Introduction to Xamarin.iOS for Visual Studio guide. If you have not been able to pair a Mac, try manually adding a Mac or take a look at the troubleshooting guide. Locate your Mac’s IP address. Depending on your network configuration, you may need to use an interface name other than en0. For example: en1, en2, etc. Click Login to connect Visual Studio 2019 to the Mac over SSH and add it to the list of known machines. Starting with Visual Studio 2019 version 15.6, Pair to Mac automatically provisions a Mac with software necessary for building Xamarin.iOS applications: Mono, Xamarin.iOS (the software framework, not the Visual Studio for Mac IDE), and various Xcode-related tools (but not Xcode itself). Pair to Mac cannot install Xcode; you must manually install it on the Mac build host. It is required for Xamarin.iOS development. 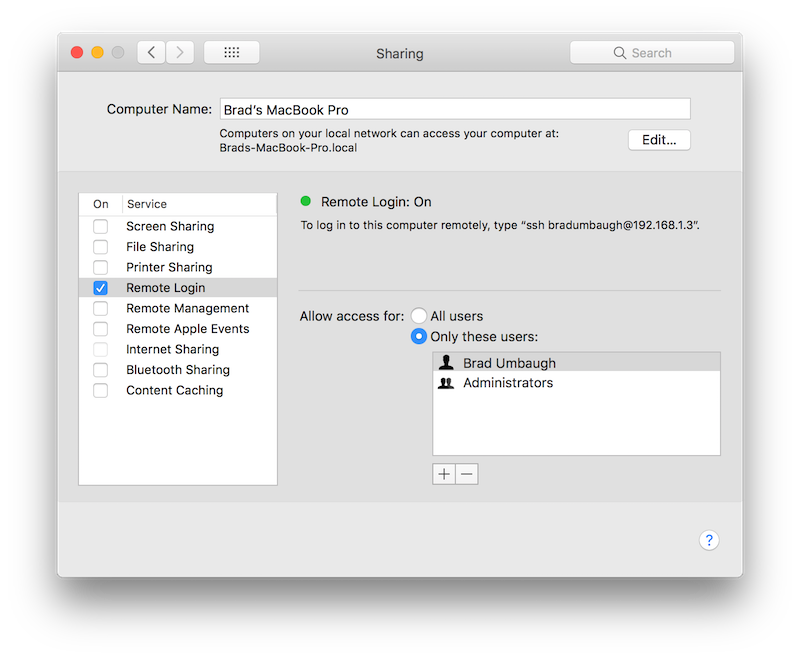 Automatic Mac provisioning requires that remote login is enabled on the Mac, and the Mac must be network-accessible to the Windows machine. See Enabling remote login on the Mac for more details. Automatic Mac provisioning requires 3GB of free space on the Mac to install Xamarin.iOS. Pair to Mac performs necessary software installations/updates when Visual Studio 2017 is connecting to the Mac. Pair to Mac will check to make sure that Mono is installed. If it is not installed, Pair to Mac will download and install the latest stable version of Mono on the Mac. Pair to Mac upgrades Xamarin.iOS on the Mac to match the version installed on the Windows machine. If you use Visual Studio 2019, select the Stable updates channel in Visual Studio for Mac. If you use Visual Studio 2019 Preview, select the Alpha updates channel in Visual Studio for Mac. The installation of these packages happens quickly and without a prompt. These tools are distinct from the Xcode Command Line Tools, which as of macOS 10.9 are installed with Xcode. If you encounter any trouble using automatic Mac provisioning, take a look at the Visual Studio 2019 IDE logs, stored in %LOCALAPPDATA%\Xamarin\Logs\15.0. These logs may contain error messages to help you better diagnose the failure or get support. ServerAddress – The IP address of the Mac build host. ServerUser – The username to use when logging in to the Mac build host. Use your system username rather than your full name. 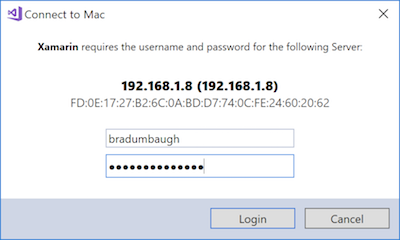 ServerPassword – The password to use when logging in to the Mac build host. The first time Pair to Mac logs in to a particular Mac build host from either Visual Studio 2019 or the command-line, it sets up SSH keys. With these keys, future logins will not require a username or password. Newly created keys are stored in %LOCALAPPDATA%\Xamarin\MonoTouch. If the ServerPassword parameter is omitted from a command-line build invocation, Pair to Mac attempts to log in to the Mac build host using the saved SSH keys. This article described how to use Pair to Mac to connect Visual Studio 2019 to a Mac build host, enabling Visual Studio 2019 developers to build native iOS applications with Xamarin.iOS.